It’s time for more “ex post facto reference,” where I answer a question that someone apparently had, because it showed up on my blog stats under the Search Terms section. Today’s reference question came from someone who, in the past week, was apparently interested in: “ncr’s john h patterson house in dayton ohio” and “john patterson house in dayton ohio”. I was a bit intrigued by this question because it caused me the realization that I didn’t actually know what they were asking about. I mean, sure, I know about John H. Patterson, the founder of National Cash Register. But the question made me realize that I had no idea where in Dayton he had lived. As a child, John H. Patterson lived on the Patterson Homestead at Rubicon Farm, south of Dayton. This was the house built by John’s grandfather, Col. Robert Patterson, and later passed down to John’s father Jefferson Patterson. Even as an adult, John kept Rubicon Farm as his summer home until he later built a new rural estate in Oakwood. Like many wealthy Daytonians of that time, John H. Patterson had a fabulous mansion in downtown Dayton. His particular mansion was located on the northeast corner of First and Ludlow Streets. 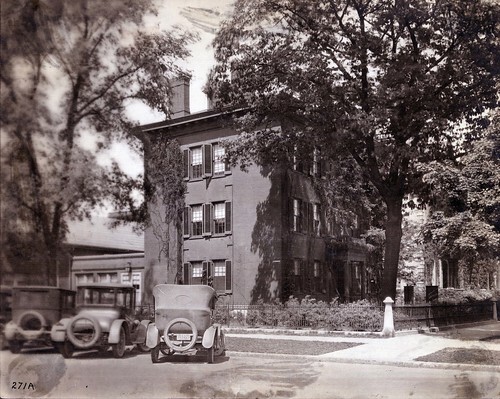 The Patterson house was razed in 1934 and a filling station built on the site. Presently, the site is occupied by the Soin Building. And, like many wealthy Daytonians of that slightly later time, John H. Patterson eventually built a bigger and more fabulous mansion in nearby Oakwood, south of downtown Dayton. He built his new country home in 1896 and called it “Far Hills.” This Swiss chalet-style home was located on the north side of Thruston Boulevard, where Wood Road meets it. 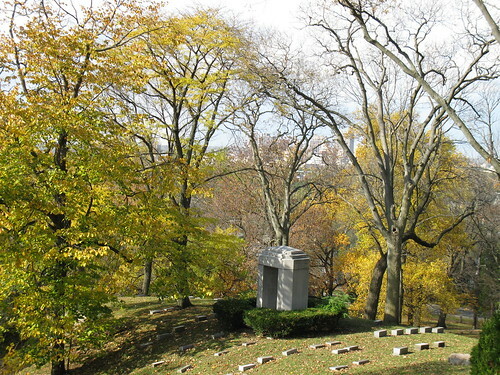 John lived at “Far Hills” until his death in 1922. 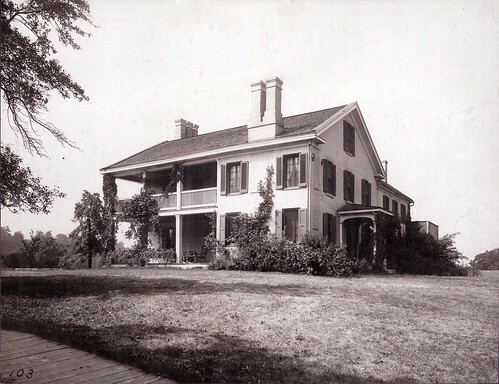 Then, his son Frederick B. Patterson had the house torn down and replaced with a French style mansion on the same site. Fred Patterson’s mansion still exists as part of the Lutheran Church of Our Savior. “Far Hills,” The John H. Patterson Home, 1909. Postcard image and description by Steve Koons. Accessed 14 Aug. 2012, http://familytreemaker.genealogy.com/users/k/o/o/Steven-D-Koons/PHOTO/0067photo.html. Google Maps. Street View. Accessed 14 Aug. 2012, http://maps.google.com. Oakwood Historical Society. “A Brief Oakwood History.” Accessed 14 Aug. 2012, http://www.oakwoodhistory.org/2_oh_brief_history.htm. Oakwood Historical Society. 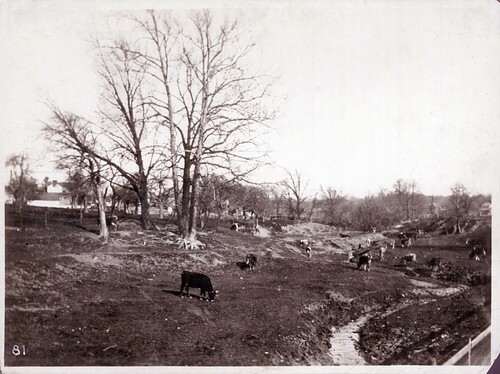 “The Town of Oakwood, 1872-1908: A Self-Guided Walking Tour.” Accessed 14 Aug. 2012, http://www.oakwoodhistory.org/Downloads/Town_of_Oakwood.pdf. Sanborn Fire Insurance Map for Oakwood, Ohio, Feb. 1941. Accessed 14 Aug. 2012, http://dmc.ohiolink.edu/oplinmap.htm. Henry Brown was born about 1770 in Lexington, Virginia, where he lived until coming to the Northwest Territory in 1793 as a military secretary. He was involved in the pack-horse brigades that transported supplies to the army at forts including Forts Hamilton, Greenville, and Wayne, until 1795. In the spring of 1795, shortly after the Treaty of Greenville, Brown became business partners with John Sutherland. The business of the firm Sutherland & Brown was to trade with the Native Americans. Sutherland & Brown was based just outside the stockade at Fort Hamilton; however, as more white settlers came to the area, the Indians began to move further north. Consequently, Sutherland & Brown sent their agents into northwestern Ohio to trade with the Indians at places such as Greenville, Fort Wayne, and Wapakoneta. 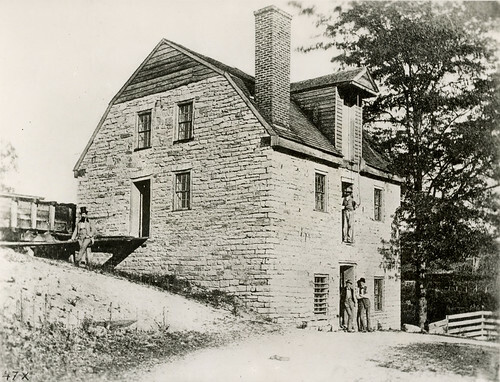 Brown set up a branch store at Fort Loramie in 1799. 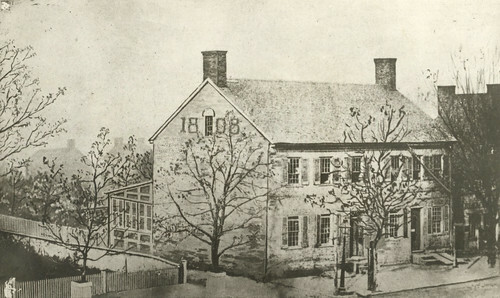 In 1804, Brown moved his branch store to Dayton, on the east side of Main Street, just south of Water Street (now Monument Avenue). His was the first store in Dayton at that time. In addition to Indian trading, Sutherland & Brown also conducted business by shipping goods New Orleans on flatboats. 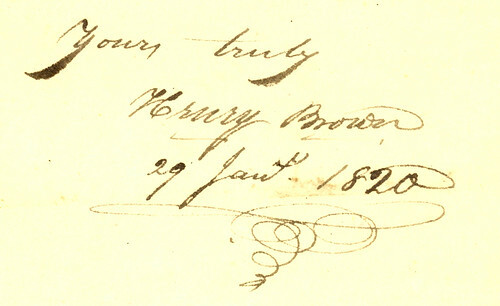 Between approximately 1797 and 1808, Henry Brown appears to have had another business partnership with a man named John Mathews. Less is known about this partnership, however. In 1808, Henry Brown built the first brick residence in Dayton, on the west side of Main Street, between Second and Third Streets, north of the Old Courthouse. By 1810, relations between the Native Americans and the United States began to deteriorate, and trade with the Indians had become especially dangerous. As a result, Sutherland & Brown recalled their agents and dissolved their partnership in June 1812. Shortly thereafter, Brown became a government agent in charge of Indian supplies, which were distributed by Indian Agent Col. John Johnston, at Piqua. Brown remained active in this business until his death in 1823. Henry Brown married Catharine “Kitty” Patterson, daughter of Col. Robert Patterson, on February 19, 1811, at Rubicon Farm. Kitty, born in 1793, was much younger than Henry. Robert Patterson (1811-1879), who married Sarah Galloway; he was a lawyer and judge and eventually moved to Kansas City, Missouri. Henry L. (1814-1878), who married Sarah Belle Browning, and engaged in the merchant business in Dayton. Eliza Jane (1816-1901), who married Col. Charles Anderson, a Dayton lawyer who later served one year as Governor of Ohio from 1865-1866; both died in Kentucky. Henry Brown became ill and was bedridden near the end of the year 1822; he died on May 19, 1823, and was buried at the old graveyard on Fifth Street. His remains were later moved to Woodland Cemetery. Henry’s widow, Catharine Patterson Brown, remarried to Andrew Irwin and had a son, A. Barr Irwin, who married Jane F. Schenck (daughter of Admiral James F. Schenck), and became a judge; he also engaged in the merchant business in partnership with his half-brother Henry for many years. Andrew Irwin died about 1827. In 1836, Catharine married Horatio Gates Phillips, another local merchant, who died in 1859. Catharine Patterson Brown Irwin Phillips died August 12, 1864, in Dayton. This biographical sketch was originally written by Lisa P. Rickey in May 2010 for the Brown-Patterson Papers (MS-015) finding aid at the Dayton Metro Library, 215 E. Third St., Dayton, Ohio, 45402; phone (937) 496-8654. Additional information about the sketch’s subject can be found in that collection and in the citations below. Please contact the library or this blog’s author for more information about how to access the original finding aid or the manuscript collection. Conover, Charlotte Reeve, Builders in New Fields (New York: G. P. Putnam’s Sons, 1939). Dayton B P318C 1939. Conover, Charlotte Reeve, Concerning the Forefathers (New York: Winthrop Press, 1902). Dayton B92 P318C. Conover, Charlotte Reeve, Dayton and Montgomery County Resources and People (New York: Lewis Historical Publishing Co., Inc., 1932), vol. 3: 11, 84. Dayton 977.173 C753D 1932. Conover, Charlotte Reeve, Dayton, Ohio: An Intimate History (New York: Lewis Historical Publishing Co., Inc., 1932), 28-30, 58-59. Dayton 977.173 C753DAY 1932. Conover, Charlotte Reeve, The Patterson Log Cabin (Dayton: The Press of the N.C.R., 1906). Dayton B P318CP. Conover, Frank, Centennial Portrait and Biographical Record of the City of Dayton and of Montgomery County, Ohio (Chicago: A. W. Bowen & Co., 1897), 913. Dayton 977.172 C753C 1897. Drury, Augustus Waldo, History of the City of Dayton and Montgomery County, Ohio (Chicago and Dayton: S. J. Clarke Publishing Co., 1909), vol. 1: 109-10, 119-23, vol. 2: 912-36. Dayton 977.173 D796. Edgar, John F., Pioneer Life in Dayton and Vicinity, 1796-1840 (Dayton: U. B. Publishing House, 1896), 88-91, 94-99, 172. Dayton 977.173 E23. History of Dayton, Ohio (Dayton: United Brethren Publishing House, 1889), 77-78, 132-33, 697-98. Dayton 977.173 H673. History of Montgomery County, Ohio (Chicago: W. H. Beers & Co., 1882), 370-84, 560-63. Dayton 977.172 H673. History of the Patterson Log Cabin (S.l. : s.n., 19–). Dayton T77173 H673. Hover, John C., and Joseph D. Barnes, Memoirs of the Miami Valley (Chicago: Robert O. Law Company, 1919), vol. 3: 476. Dayton 977.1 M618. Steele, Robert W., and Mary Davies Steele, Early Dayton (Dayton: U. B. Publishing House, 1896), 32, 82-83, 96-97. Dayton 977.173 S814E 1896. Robert Patterson was born March 15, 1753, in Bedford County, Pennsylvania, a son of Francis and Jane Patterson. Col. Patterson, one of the earliest settlers of Dayton, Ohio, was well-known as a pioneer of the Northwest Territory and officer in the American Revolution. He was one of the founders of Georgetown and Lexington, Kentucky, in 1776, as well as Cincinnati in 1787, before coming to Dayton. 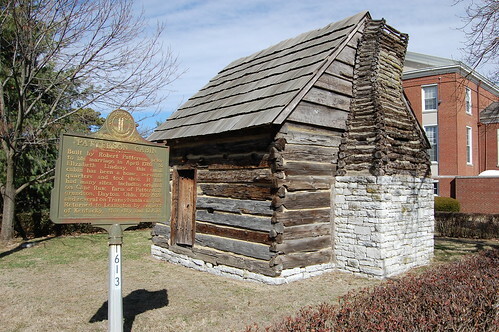 [Col. Patterson built a cabin in Lexington, Kentucky, about 1780. About 1901, his grandson John H. Patterson bought the cabin and had it removed to Dayton (exterior photo, interior photo). The cabin was later returned to Lexington about 1939. Col. Patterson purchased some land in Clifton (Greene County), Ohio, in 1803, but later decided to move to Dayton instead. He purchased a farm just south of Dayton and moved his family there in 1804; he named the homestead “Rubicon Farm.” He later purchased more land adjacent to the original tract, and his farm eventually occupied 700 acres. Col. Patterson was a participant in several expeditions against Native Americans on the western frontier. He fought with the Pennsylvania Rangers in 1774. During the American Revolution, Patterson was with General George Rogers Clark on the Illinois Expedition in 1778, and he was a captain under Clark when he fought the Shawnee on the Little Miami and Mad Rivers in 1780. He was second in command at the Battle of Blue Licks (Kentucky) in 1782 and, now a colonel, subsequently accompanied Clark on his second expedition into the Miami Valley. Patterson also served as a colonel under Col. Benjamin Logan against the Shawnees in 1786. He also participated in the Battle of the Wabash, also known as St. Clair’s Defeat, in 1791. Robert Patterson received the commission of colonel from Virginia Governor Patrick Henry in 1787. Robert Patterson served as a delegate to the Virginia legislature in 1790; after the state of Kentucky was formed, he served as a representative to its first state legislature, in 1792. During the War of 1812, Robert Patterson served as a quartermaster, transporting supplies from Camp Meigs (located near Dayton on the Mad River) to troops located north of Dayton. William, who died as an infant. Rebecca (1784-1858), who married Dr. John Goodlet and died in Kentucky. Margaret (1786-1861), who married three times, to Dr. Samuel Venable, Rev. James Welsh, and Samuel Caldwell, and died in Iowa. Elizabeth (1788-1827), who married James I. Nisbet. Francis (1791-1854), who moved to Missouri. Catharine (1793-1864), often called Kitty, who married Henry Brown, then after his death married Andrew Irwin and later Horatio Gates Phillips. Jane (1795-1876), who married John Steele. Harriet (1797-1822), who married Henry Stoddard. 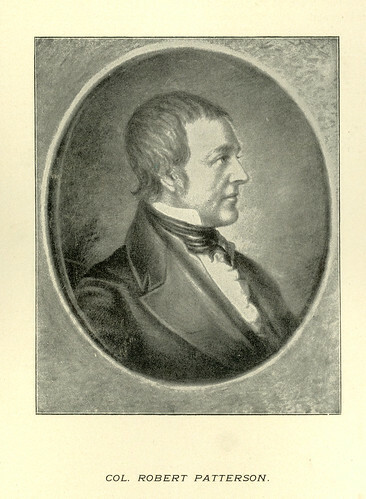 Robert Lindsay (1799-1833), who died of cholera during the epidemic of 1833. Jefferson (1801-1863), who married Julia Johnston, daughter of the Indian agent John Johnston of Piqua, and inherited Rubicon Farm. 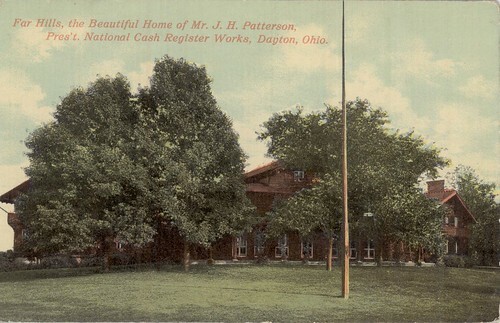 Two of Jefferson and Julia’s children, John H. Patterson and Frank J. Patterson, founded National Cash Register Company in Dayton. Col. Robert Patterson died August 5, 1827, in Dayton. He was originally buried at the old graveyard on Fifth Street, as was his wife Elizabeth, who died October 22, 1833. Both were later moved to Woodland Cemetery, which is adjacent to land previously owned by Patterson. The remains of many members of the Patterson family, including Col. Robert Patterson, are in the Patterson Knoll, at Woodland Cemetery.